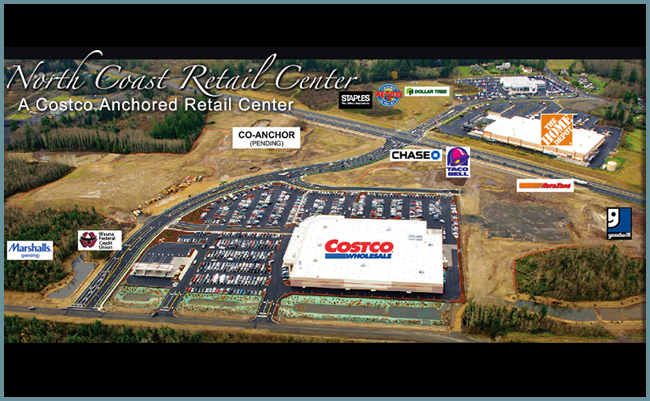 NORTH COAST RETAIL CENTER is a 75 Acre development featuring a new COSTCO as an anchor tenant. With 1,500 feet of highway frontage the property shouts maximum exposure for every imaginable retailer. Ingress and egress are made easy with a fully lighted intersection, turning lanes and terrific visibility. We will break ground on a 25,000 sq ft Goodwill Industries store in the spring. 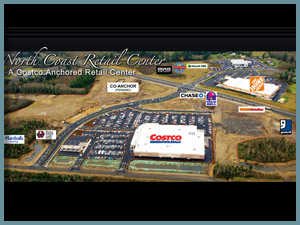 Adjacent to Costco we have a 15,000 sq ft tenant (to be announced). Directly across Hwy 101 is a newly opened Home Depot and new Toyota/GMC auto dealership. Other nearby tenants include Fred Meyer, Ross Dress For Less, Rite Aid, WalGreens, Chevrolet-Cadillac and Suzuki auto dealers, Shilo Inn Hotel, and Columbia Fitness Club (1000 members). 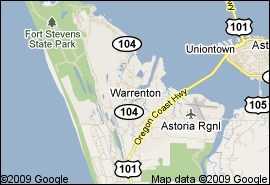 The Astoria regional airport is within a few miles, as is a large US Coast Guard Air Base and a National Guard Training Facility. There are several other employers within a short distance in addition to a 600 lot residential development only a half mile away. Alternate Hwy 101 will pass directly through the shopping center, where it will connect with Coast Hwy 101. Warrenton is the regional shopping hub for both the North Oregon and South Washington Coastal populations. Serving the entire demographic areas of Clatsop and Pacific Counties, the actual trade area encompasses nearly 100,000 people. The region has long been under-retailed with several of the local shoppers opting to drive two hours to Portland for major shopping trips. However, with North Coast Retail Center under way, we aim to provide many more shopping opportunities so that we may keep those shopping dollars where they belong - NORTH COAST RETAIL CENTER! Ideally located a few miles from the cities of Astoria and Seaside, the property lies in the center of the county putting it at a crossroads for both locals and tourists visiting the coastal towns, campgrounds and beaches. All materials on this Web site ©2012 Myriad Commercial Properties, Ltd. All rights reserved.